Would you listen to Spelling It out for Your Man again? Why? YES YES AND YES!! It's conversational and excellent quality. Full of incredible insights. PUTTING RELATE BACK INTO RELATIONSHIPS! This is an excellent source of information helping you to truly ground yourself in self-worth. Inspiring! If you consider yourself spiritual but not religious, then you're going to love this inspirational book. And if you want to lead a simple and uncomplicated life with happiness at your fingertips, then you'll want to hear this pause-resister more than once! 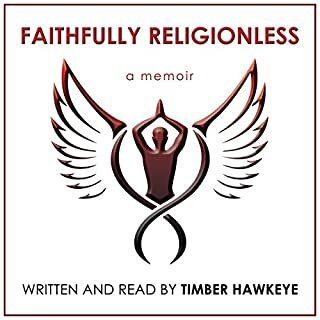 Faithfully Religionless is a MUST-READ! Would you consider the audio edition of Faithfully Religionless to be better than the print version? Both are excellent! Audio is extremely convenient and emotionally contagious. Loved it. This book made me want to embrace my personal traditions in new ways. It made you want to live with more compassion and acceptance while taking full responsibility for your life. What about Timber Hawkeye’s performance did you like? He made you feel like you were listening to a good friend. His voice was great! It was an all around excellent book and reading. Inspiring, enlightening and filled full of truth.